Location: Mija Cantina & Tequila Bar in Quincy Market, Boston, Massachusetts. A sidewalk table, under an awning, with a view of all the foot traffic and shenanigans, like this guy. Even though there’s canvas over our heads, small almond shaped yellow leaves rained onto our table. My plan for the whole trip was to eat as much (non-killer shellfish) seafood as possible, so I ordered the table Mango Chili Calamari for an appetizer. My parents and (unofficial big-brother) Rod settled for Chicken Nachos for us to share, and lets not forget a round of drinks. I had reservations. Not for the restaurant, but about the trip. Reservation #1: 3:51 A.M. It’s not that I hate getting up early—I loathe it with each strand of my DNA. Morning is a terrible time that should only be seen if you are getting home after a long night. But our airport-shuttle was scheduled to pick us up from my place at 3:51 A.M. I hate you 3:51 A.M. Reservation #3: I’m a lone traveler. 80% of my travels have been solo. I’m excellent at traveling alone. Normally, my one “must have” for a trip is headphones and music, because having to talk to people while in transit makes me want to stab my ear-balls out. My reservations were for naught, though. The highlight of the travel there was my parents marveling at the rolling walkways in the Detroit airport. I was leading us through the terminals so they couldn’t see me giggling to myself over their wonderment—I mean they had seen The Jetsons. I had to give the cab driver the address three times, finally spelling out the street “C-A-U-S-E-W-A-Y”. Apparently Kansas doesn’t translate well to Bostonian. The address was for the gym where Rod works. A class had just let out, and my parents and I waited on a stack of mats until Rod emerged from a forest of punching bags. He picked me up and smashed me in his unique version of a hug. My back popped and once he’d squeezed all the air out of my lungs I smacked him on his ears to get him to drop me. After stashing our bags in Rod’s truck, the four of us headed on an impromptu walking tour of Boston. This trip happened to be two days before Rod’s 40th Birthday. And, everyone who’s a younger sibling knows the best part of being the youngest is your older siblings will always be older. I spent the walk reminding Rod that he’s about a million years old, and the city gave me plenty of ammunition. I asked him “if it was hard to get used to pavement after all those years he only had cobblestones”, and “what was it like to ride in a horse and buggy”, and when we passed a statute of some dead guy I wondered if he “missed his friends from that Tea Party”. Rod threatened to push me into oncoming traffic, but I know he loved every second of our walk as much as I did. 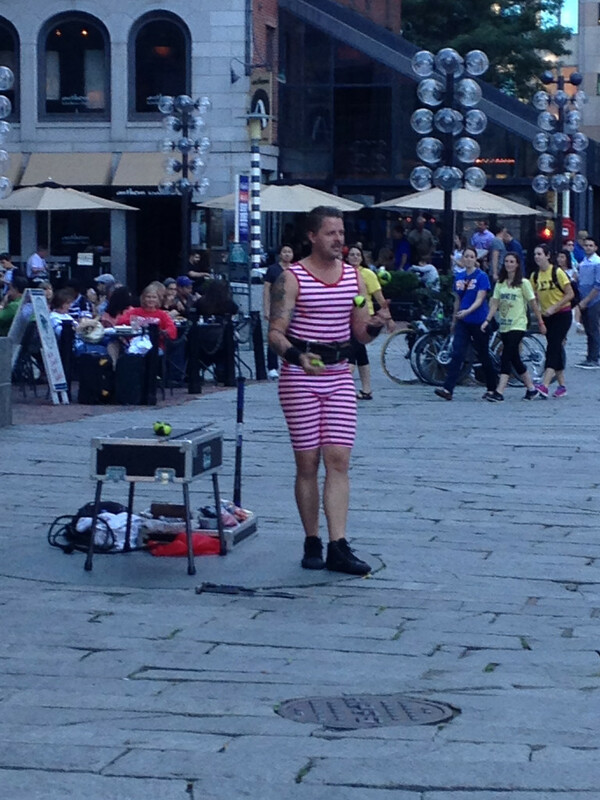 We followed cobblestones to some crooked roads filled with street performers, ending up in the center of Quincy Market. My only request for lunch was to sit outside. Rod guided us to his favorite tequila bar, telling me we had to get the duck taquitos. Immediately the children started in on the Tequila—I tried the signature Margarita with Avion Silver Tequila, orange liquor, and fresh squeezed limes. Rod got something called a Don Quijote. (They had spelled it wrong, but I was still pleased he ordered it because it was from a book.) Mom ventured into the mix with a berry mojito, and Don went for the sangria. A light lunch of grilled fish tacos on flour tortillas made me happier, or maybe it was those margaritas… I assumed the mahi-mahi wasn’t pulled out of the bay, but in fish towns they know how to cook fish. The mahi-mahi was smoky and tender with just enough Dijon cilantro and Pico to make the tacos feel fresh. Not too heavy after all that fried nonsense we’d consumed. As a matter of fact, they were so good we celebrated with another round of drinks. Mom and Don stuck with the tacos too. Don got the tempura battered Baja fish tacos while Mom settled on the beef. I didn’t try either of them, but they ate them without complaint or compliment so I assume they were of the same caliber as the nachos, perfectly adequate but not very memorable. Of course Rod ordered something at the edge of disturbing. An enormous chimichanga served in a ten-inch cast iron skillet, smothered in cheese sauce with sides of beans and rice. I had no doubt Rod would scrape every last morsel of edible material from the skillet, (I’ve seen Rod put a whole chicken wing in his mouth and ten seconds later spit out clean bones. It really is a marvel to watch him eat.) But there’s something off-putting about knowing a human can consume so much food and still have room for dessert. There’s a high probability we celebrated his empty skillet with another round of drinks. I left the cantina more full of liquor than food, but that is how it should be at a tequila bar. The food served its purpose and was a decent accompaniment to our cocktails—but nothing we ate rocked my face off. What I’ll remember about the meal is sitting outside on a perfect day in Boston. Watching weird-os walk down the street as Mom, Don, Rod, and I caught up on each other’s adventures since Rod had moved to Boston. It was a great dinner, but it wasn’t because of the food. As usual, enjoyed this piece.